We fell in love with this enchanting cottage because of its vintage quality and location. It is a sweet old cottage that we have totally renovated. You walk out the door and within steps you are at the sea. 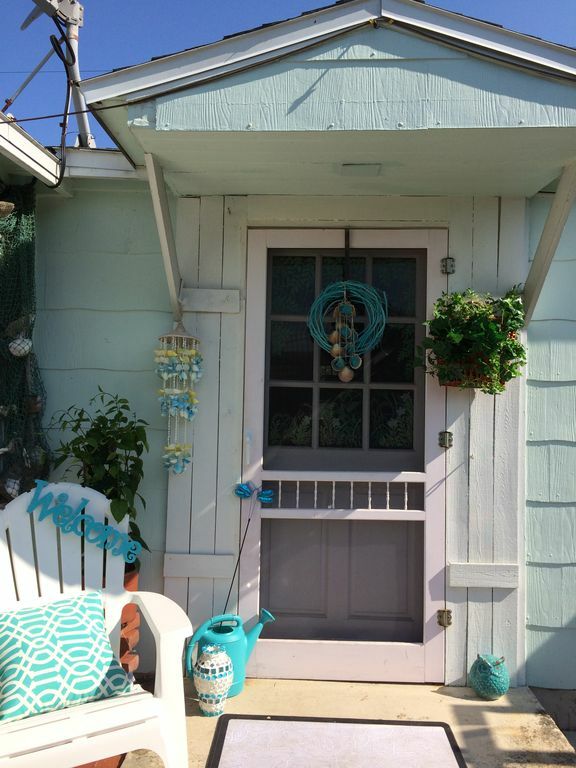 This is an old fashioned 1930's beach cottage with lots of privacy as it is totally fenced in. We've hired a talented gardener/ designer who uses Florida native beach flowers and grasses to create a casual shore setting. Come and relax at our 1930’s totally renovated cottage by the sea. We've decorated it with charming vintage finds. Including chandeliers that light up the patio area at night creating a magical setting for romance and family fun. We love sitting on the deck at night feeling the breezes off the ocean. Immerse yourself in the world of Old Florida, the way it used to be. Grab your coffee and watch the miracle of a sunrise as the dolphins play and the pelicans fly overhead. Sometimes you will see a couple of the locals fishing and it's fun to check if they "got lucky" yet. It's so peaceful walking along our quiet beach to the inlet where you can see the old St Augustine lighthouse on the other shore and other historical sites. Many activities are available at the beach...parasailing, fishing, kayaking, boating. Why not sail on the pirate ship “Black Raven' If you sail on Wednesday it docks at Aunt Kate’s restaurant for a delicious seafood dinner. We also love walking to our favorite local restaurants for breakfast, lunch or dinner. (We’ll leave you a list). You can walk to our beautiful pier (you can fish from it) too. Feel like visiting the 16th century? A short ride over the bridge and you are in ancient St. Augustine. The oldest settlement and fort in the USA. Explore the historical sites and enjoy the family owned restaurants. Take a tour. Either a trolley or a romantic horse and carriage ride. Fall asleep to the sound of the surf and the swaying palm trees in our hammock on the deck. Yes you can see the ocean from the deck. We rented a cottage in the area and fell in love with the location. I had always dreamed of having a cottage by the sea where we could grab our coffees, walk the beach and watch the sunrise. The charming quaint cottages and the quietness of the area are so relaxing. There is a beautiful nature walk across the street. Having the ancient city of St Augustine so close by makes the location perfect. Interesting restaurants and beautiful architecture just make it a dream location. St. Augustine is a very magical city. Take a horse and carriage ride! We love and use the cottage whenever we can. I like to think of our guests as friends, who are enjoying our cottage. In addition to being less than 10 minutes from the ancient city, you can walk to at least 3 good restaurants and our local supermarket, Publix. The beach is a few steps from your cottage door. When you are on our deck you can see the ocean. You definitely hear the waves from the cottage. Linens provided: Thick bath towels, hand towels and wash cloths, blankets, sheets, pillows and pillow cases for each bed. Generous comforters ,toilet paper, hand soap, bath soap, shampoo and conditioner provided. Full kitchen: Brand new kitchen installed in May 2011. All white with white lace curtains, and cupboards. Very sunny and bright. Double sink, new stove, coffee maker, new wide slot toaster, microwave, lots of storage space in cabinets. Lots of flowers. Wild beach flowers are everywhere. On the deck you will love swaying in the hammock or enjoy dining with the ocean breezes. A short walk down the beach or down the road from the cottage and you will find a wonderful breakfast/lunch cafe. Also two other really good restaurants within walking distance.....we'll leave you all the info. There is also a cozy area on the screened porch to have your wake- up coffee. A wonderful way to end the day is sitting on the deck, high in the palm trees, feeling the ocean breeze. You can see a little bit of the ocean! The beach cottage was all that we expected. I would describe it as quaint, homey and comfortable. The kitchen and bathroom were modern and fully equipped. The place was very clean. It was a short walk to Vilano beach, and a short and easy drive to downtown St. Augustine. The location was perfect. There was a tremendous amount of outdoor space, including places to lounge, sit, and relax. The outdoor grill worked great the one time we used it. I would not describe the cottage or its furnishings as luxurious by any stretch of the imagination. It was not described that way, nor were we looking for that. It was comfortable and we felt right at home. I would say that the descriptions exactly matched what we found and expected. I would not only recommend this but would stay here again without hesitation. I communicated with Carolyn on only one occasion, and she responded within a very short time. We look forward to you returning to us. Cottage has lots of vintage style and includes everything needed for a weekend or extended stay. Multiple seating and dining areas inside and out. A short walk to the beach completes the experience. Wonderful cozy cottage. Great location. Loved it. We are so pleased you had a wonderful time at our cottage. We used the beachouse as a short term rental between two other trips which ended and began in Florida. The house is a charming older bungalow close to the beach. Everything we needed for our stay was provided. The house was clean and well kept and we had a very nice stay. Having the use of a washer and dryer was greatly appreciated. The only negative comment We would have is not the owner’s fault. The water in St. Augustine, I am assuming the house is connected to the public water supply, has a horrible sulfurous odor. We bought bottled water to drink, but this water is not pleasant for bathing, showering or doing laundry. This was our first VRBO rental and I would definitely stay here again if we ever return to St. Augustine. The owner was pleasant and helpful with the few questions we had regarding the property. It’s strange, we have been renting our cottage out for over 8 years and we have never gotten a complaint regarding the water. We also have many return guests. Showering and laundry are not a problem with regard to a sulfur odor. Apparently some people are more sensitive. We don’t smell any sulfur while showering or doing the laundry. My preference is bottled water. My husband drinks the tap water. I’m so sorry that was a problem for this guest. In the future I’ll make an effort to leave a some bottled water in the refrigerator. Perfect place for a home away from home and a chance to relax and enjoy the beach. Very convenient to the supermarket which can be reached by walking along a pathway rather than the busy A1A. Cottage is comfortable and has everything you need. We had no issues at all. We have stayed at six different places along this stretch and this cottage is the one we would stay at again if available. Like a previous review we were also concerned about traffic noise due to the proximity to the bridge but I can say that we hardly noticed it even with just the overhead fans and doors open. this is our home away from home, but much more relaxing! we will comw here as long as possible. i would live here and be totally happy!!! I’m so happy you feel our cottage is your “home away from home”! You are a joy to us and we are always happy when you return.